When the idea of Russo-Swedish War of 1808-1809 project was first talked about the decision was to aim for as historically accurate terrain as possible. The 21 volume book Sveriges Krig Åren 1808 och 1809 had 19th/20th century maps for the battles. Lakes, rivers, forests, houses and so on have been clearly and well marked on the maps. In addition they give rough position of hills. The rough positions would have been about perfect for your traditional “styrofoam hills on a green gaming cloth”-gaming table, but we wanted to get more correct topographical feel to them if possible. Just the modern contours lines were printed out on normal colour printer and the printouts were taped together to make one big 270x150cm map. This map was used a build up terrain. 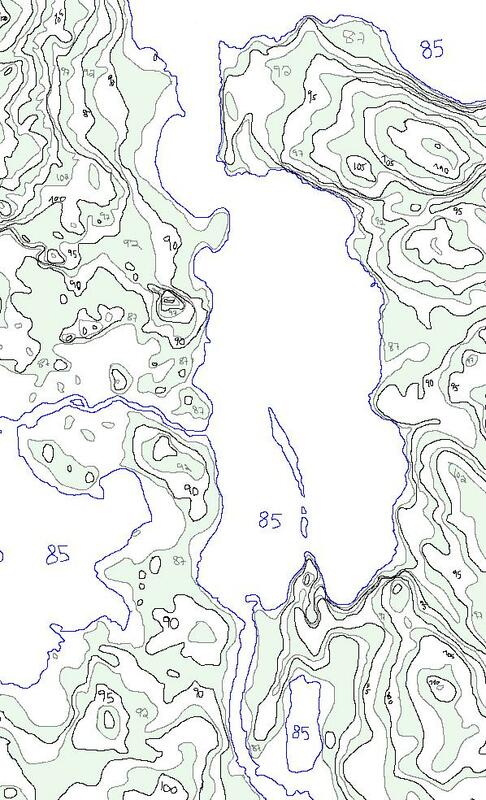 The combined map (old map with contour lines) enabled us to model lakes, rivers, forest, houses and other features on the terrain in the right places.